Beautifully illustrated and richly imagined, Ruskin Bonds new book will entertain children and adults alike. Did you see him shoot a tiger? I asked. Oh, many times, said Mehmoud. A tiger a weekthat was nothing to Carpet-sahib! Did the tigers come to the house, or did you go looking for them? 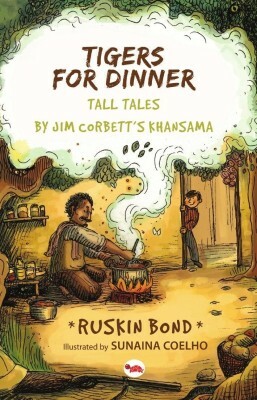 Thus starts Mehmouds stories about working as khansama, or cook, for the great shikari Jim Corbett. As deft with his stories as he is with koftas, lamb chops, pies and milkshakes, Mehmoud has a tall tale for every occasion. From wrestling with a cobra in his bed, being carried away into the river by a muggermuch, to when a tiger came looking for the cook, these stories leave little Ruskin spellbound. Join Mehmoud in the kitchen as he cooks up one delectable meal after another, and gobble down his delicious stories of man-eating tigers, incompetent maharajas, missing kitchen boys and haunted pillows, all brought vividly to life by Sunaina Coelhos captivating illustrations. About the Author Ruskin Bond has been writing for over sixty years, and has now over 120 titles in print novels, collections of stories, poetry, essays, anthologies and books for children. His first novel, The Room on the Roof, received the prestigious John Llewellyn Rhys award in 1957. He has also received the Padma Shri, and two awards from the Sahitya Akademi one for his short stories and another for his writings for children. In 2012, the Delhi government presented him with its Lifetime Achievement award.